Simon & Schuster Books for Young Readers, 9781534410329, 40pp. A creature has eaten his friend. Now he’s on a journey to find a new one with hilarious consequences in this bright, subversive debut picture book. A little creature is looking for a new friend, but he’s not having any luck. Why is he looking for a new friend, you ask? Because he ate his old one! Heidi McKinnon delivers a hilariously macabre story with colorful illustrations and a satisfying, dry wit. Heidi McKinnon studied art and design at RMIT University in Melbourne. After graduating, she worked lots of weird jobs until she began a career as a graphic designer. She lives with her partner, Seamus, and her daughter, Ava, in Fitzroy, Australia. 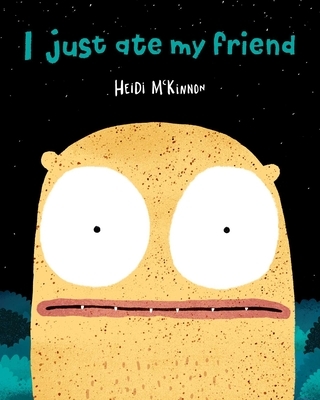 I Just Ate My Friend is Heidi’s first book. She has never eaten a good friend.